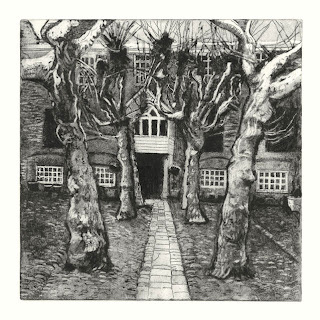 This is the latest print, of Gray's Court in York. 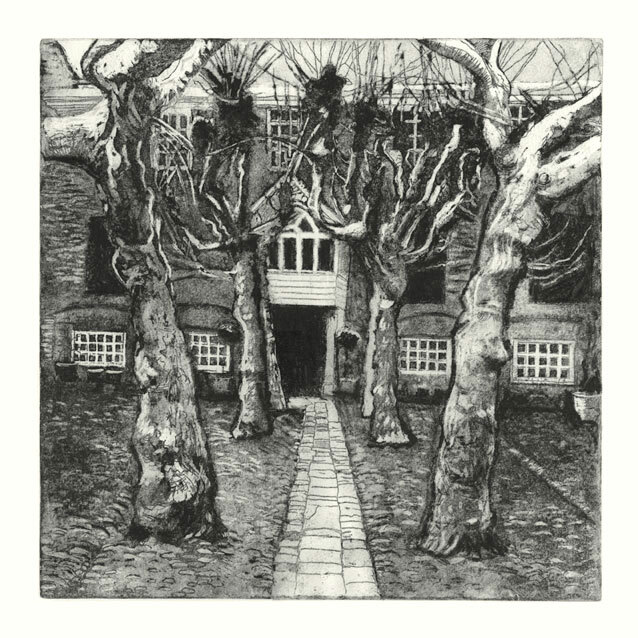 Its an etching with added detail, and is 30x30cm. Although a beautiful building dating back to the Middle Ages, I couldn't resist giving it a gothic quality in mood. The longer you look at the trees the more spooky they appear. I wanted a rough textured quality to the marks, especially on the trees and cobbled floor. Also the doorway is a dark entrance with the white woodwork surrounding it, and so became the focal point of the image. I have more exhibition news, my work will be shown at the WYPW as part of Printmakingonline. The show runs from Saturday 21 July to Saturday 18 August. It is held at the West Yorkshire Print Workshop in Mirfield, near Leeds and Wakefield.